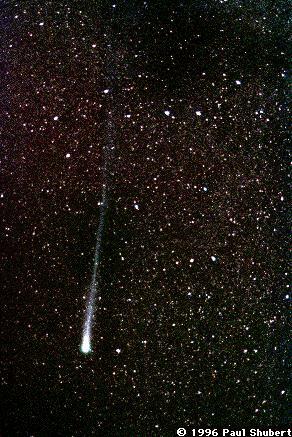 The photo shows comet Hyakutake set between the big and little dippers, with its head near Polaris and the tail of the comet stretching over 30 degrees into the bowl of the big dipper and beyond. The photo was taken at 09:00 UT on March 26 at Sandia Park, New Mexico, which is approximately 30 miles east of Albuquerque at an elevation of 6900'. The image was exposed for 2 minutes at f/2.8 on Ektar 1000 through a 28 mm lens. The camera was attached to a Celestron C8, which served as the clock drive. The scanned image was digitally processed to enhance contrast and fix the ills of one hour photo processing.